Organized by Mass Action Against Police Brutality (MAAPB), the Not1More Rally Against Police Brutality gathered more than 120 activists, students, Boston residents, and concerned community members on a rainy, chilly day. Organizers felt that even though hundreds of thousands took to the streets in recent weeks to protest gun violence in the United States, police gun violence has largely been left out of the conversation. This was underscored by the shooting of 22 year-old Stephon Clark, an unarmed Black man, in Sacramento, California, a killing which has sparked nationwide protests for more than two weeks. The demonstration also coincided with the 50th anniversary of the assassination of Dr. Martin Luther King, Jr. I first encountered MAAPB in June 2017 at a rally and march they organized in Roxbury's Dudley Square to protest police brutality. Feeling frustrated by recent cases of extrajudicial police killings and the lack of intersectionality in gun violence conversations, I showed up to show my outrage, support the families of victims, and report on the movement. It is difficult to find uniform statistics on lethal police shootings in the United States, in part due to the lack of reliable government data collection, as explained by The Guardian. Through the Violent Crime Control and Law Enforcement Act of 1994, specifically Section 210402, the U.S. Congress mandated that the attorney general collect data on the use of excessive force by police and publish an annual report from the data. However, the bill lacked provisions for enforcement. The Guardian reports that in part due to the lack of participation from state and local agencies, the Bureau of Justice Statistics stopped keeping count in March 2014. Following public attention to police-related killings after several well-publicized cases such as Eric Garner and Michael Brown, journalistic and crowd-sourced projects have emerged to track police shootings. According to the Washington Post police shootings database, which tracks fatal uses of force, 294 people have been shot and killed by police this year as of April 5, 2018. The same database reported that 987 people were fatally shot in 2017. 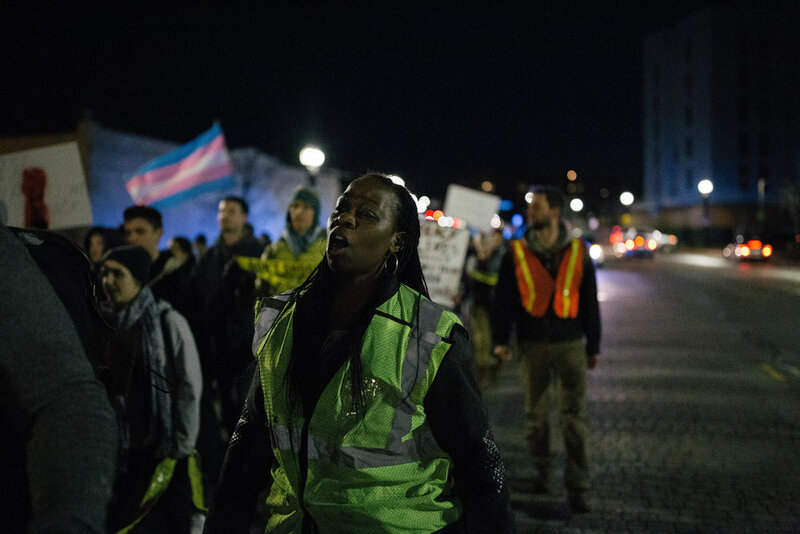 Tracking broader patterns of police killings is Mapping Police Violence, a project affiliated with Black Lives Matter. The project reported 1,146 people killed by police in 2017 through some form of harm including shooting. The Washington Post database also showed that in 2017, White people represented 42% of who was shot and killed by police, and Black people were 23% of the total killed. These statistics are similar in racial proportion to felony charges, yet Blacks only account for only 13% of the population. Moreover, between 2011 and 2014, the probability of being black, unarmed, and shot by police was 3.49 times higher than the probability of being white, unarmed, and shot by police, according to a study published in November 2015. Satter also called for greater accountability from elected officials, including Suffolk County District Attorney Daniel Conley, in reference to the case of Mary Holmes. In 2014, Roxbury resident Mary Holmes was pepper-sprayed and beaten with a baton by two Massachusetts Bay Transit Authority (MBTA) police officers when she attempted to help another woman at the Dudley Square bus station. According to The Boston Globe, Holmes sued the officers in 2015 in US District Court and added the MBTA a year later. She finally reached a settlement with the MBTA in June 2017, also requiring the agency to post its use-of-force policy online and make it easier to file online complaints about officers’ conduct. Jennifer Garvey, one of the officers involved in the situation, was indicted by DA Dan Conley on criminal charges in 2016. She was found guilty of assault and battery and filing false reports, then sentenced to six months in jail in August 2017. MAAPB insists that the prosecution needs to change to include the additional officers who were involved with Garvey and helped her file the false police report. 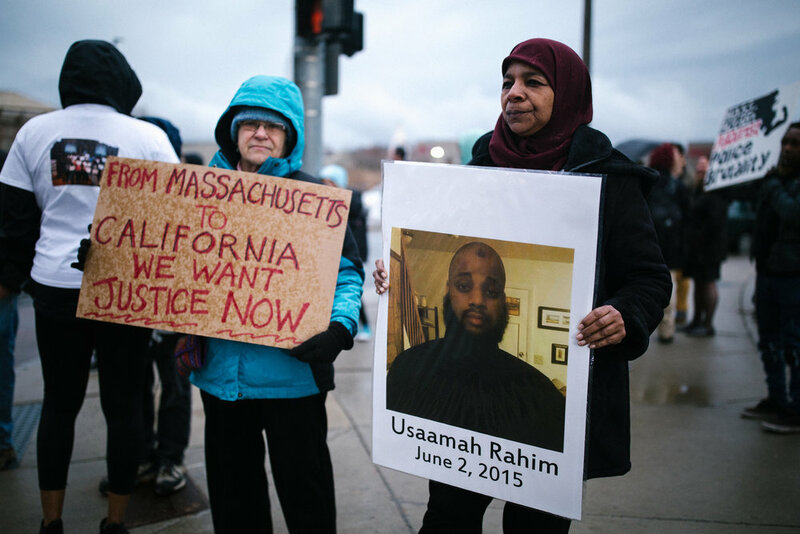 Rahima Rahim, mother of Usaamah Rahim, who was killed by an FBI agent and a Boston police detective in Roslindale on June 2nd, 2015, demanded that her son's case be reopened. The story drew national attention from The New York Times, CNN, CBS News, and NBC News as Ussamah Rahim was a suspected ISIS-affiliated extremist. According to the arrest affidavit obtained by The New York Times, Mr. Rahim had been under surveillance since May 2015, when he purchased three knives on Amazon.com. A law enforcement official also claimed Mr. Rahim had become radicalized online and that he posed an “imminent threat” on the morning he was confronted, and ultimately killed. Rahima Rahim, relatives, and Muslim leaders in the community were unaware of any radicalization, but remained dedicated to ensuring a transparent investigation. Ms. Rahim is now left without answers. In August 2016, DA Dan Conley said the shooting of Mr. Rahim in a parking lot by members of an anti-terror squad lot was justified, and prosecutors did not bring charges against the detective and FBI agent. Mr. Rahim’s nephew, David Wright, was also arrested in connection with the terror probe. In December 2017, Wright was sentenced to 28 years in federal prison for plotting to kill Americans on behalf of the Islamic State. For Hope Coleman, she did not expect that a 911 call to come to the aid of her mentally ill son would result in his death. On October 30, 2016, Ms. Coleman called an ambulance to take her son, Terrance Coleman, who was 31 years old at the time and diagnosed with paranoid schizophrenia, to the hospital because she was worried he would catch pneumonia after sitting on the stoop of her South End apartment for two days. When the EMTs and two police officers arrived, one of the officers fatally shot Mr. Coleman in the abdomen twice, saying that Mr. Coleman turned on them with a knife. Boston Police Commissioner William B. Evans said, “We have to meet deadly force with deadly force.” Hope Coleman strongly disputes this claim, saying that Terrence was unarmed, that he posed no harm to the officers who were outside the apartment, and that the knife lay untouched on the kitchen table. It has been Hope Coleman’s mission ever since to find justice for Terrence’s death. In August 2017, the Suffolk County DA Daniel F. Conley’s office released its independent investigation of the shooting and found that the officer who shot Coleman, Garrett Boyle, was justified in using deadly force during the confrontation. 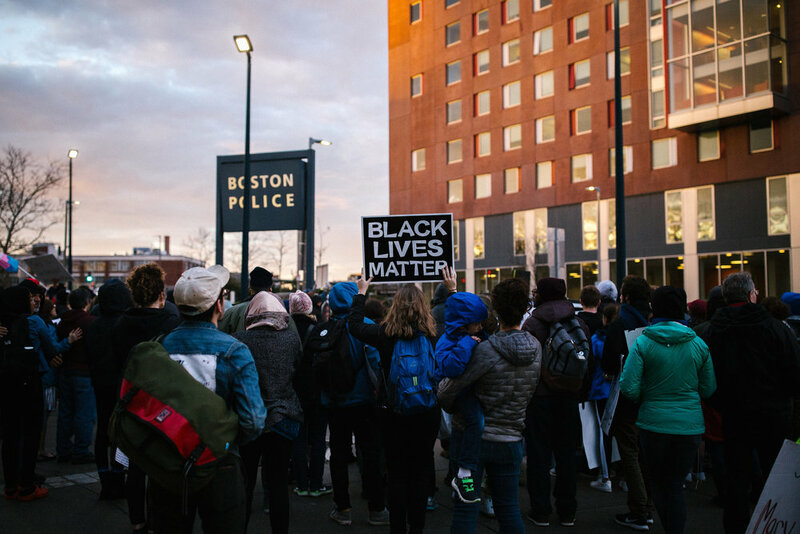 On April 4, Ms. Coleman filed a federal lawsuit against the City of Boston, Boston police, and city emergency medical officials, alleging lack of training and discriminatory policies led officers to kill a man suffering from chronic mental illness. As reported by WBUR, the complaint – filed by the Boston-based Lawyers’ Committee for Civil Rights and Economic Justice and the law firm Fick & Marx – say that police unnecessarily responded to a 911 call from Hope Coleman for an ambulance to take Terrence to the hospital for medical attention. It says Terrence Coleman's death was "a result of a BPD officer’s use of excessive, unreasonable, and deadly force" and that the city "systematically and knowingly fails to train its police officers and EMTs to provide appropriate services" to people with mental health disabilities. “I thank you all for coming out here, it wasn’t easy. You know how it is in Boston with the weather. You all have a lot of heart to come out here in the rain and not knowing how things are going to turn out,” Zahra stated. Immediately indict and arrest the police officers who killed Stephon Clark. Stop any police harassment of witnesses, family, or protesters of this outrage. Immediately indict and arrest Massachusetts State Trooper Matthew Sheehan for the shooting of an unarmed Cape Verdean ATV driver and for racist online postings. Immediately fire Boston Police Officer Zachary Crossen, who was recently seen harassing and racially profiling a Black resident who was not engaged in any criminal activity in a viral video. Immediately fire and convict off-duty Boston Police Officer Dominic A. Columbo for causing life threatening injuries to Dorchester resident Jose Teixeira while Columbo was drunk and speeding on New Year's Day. Fire Boston Police Officers Garrett Boyle and Kevin Finn for the shooting of Terrance Coleman. Full financial compensation for families of victims and survivors of police brutality and an immediate end to the intimidation of victims, survivors, their families, and protestors. “Let’s also be clear this isn’t just about the police, it’s about the police unions. The unions are causing this, and unfortunately when they murder someone and they do a payout, the police officers aren’t paying out, your taxes pay for that life that was taken. So that school we don’t have in our community? That’s because they murdered someone,” said Bell-Sykes. To learn about Mass Action Against Police Brutality and join their movement against police violence, visit their Facebook page and website, MAAPB.org. Nicole Eigbrett is the Director of Communications for Weave News and occasionally reports on social justice movements and transracial/transnational adoption. Follow her on Twitter @Nicolewhaat. Photos by Emily Goldhammer: www.emilygoldhammer.com and on Instagram @emilygoldhammer. View her collection of photos from Mass Action Against Police Brutality’s Not1More rally here.